The grand palace of Assurnasirpal (Ashurnasirpal) II was one of the most incredible sites of ancient Assyria. Located in Nimrud, Iraq, the immense palace was richly decorated with sophisticated alabaster reliefs. It was a true power center. Although the palace is now covered with the sands of a ruined city, its amazing architecture and history has not been forgotten. In fact, the whole city of Nimrud was essentially one huge palace for Assurnasirpal II. He created the new city as a symbol of his immense wealth and authoritative position. The craftsmen employed for this project had to rebuild what preceded the palace and then decorate it with the utmost luxury to please their king. The court of Assurnasirpal II was full of lively celebrations, but the king’s hunger to produce a site he saw worthy of his presence consumed countless resources too. Even though it was a dramatic act, it was successful – the palace’s fame has withstood the passing of time and its unexpected destruction. Nimrud (Kalhu) is located near the northern part of Baghdad. The site was rediscovered in the 1840s by a team of British archaeologists led by A. H. Layard. These archaeologists (and several others) took many of the most expensive and imposing decorations from the palace to the collections of museums around the world. Few would be surprised to know that the British Museum has one of the biggest collections of the palace’s artifacts. The city of Nimrud covered about 360 hectares (equivalent to about 360 international rugby fields or 425 international ice hockey rinks) and was surrounded by a wall measuring 7.5 kilometers (4.6 miles). About 16,000 people lived there. The palace itself was approximately 200 meters long (656 ft) and 130 meters wide (426 ft). Nowadays, it is known as the Northwest Palace - which accommodated the administrative wing, private quarters, and state apartments. The palace’s stone slab reliefs and inscriptions provide insight into the king’s ideology and events during his reign. The decorations depict military successes, hunting scenes, extensive trade, the kingdom’s wealth, relationships between humans and animals, and symbolic representations of foreign relationships. Altogether the artwork suggests prosperity. These grandiose images were protected by intimidating lamassu - winged mythical lions with human heads, who guarded Nimrud. The city’s wealth is also illustrated by a discovery made in 1989. That is when archaeologists found the tomb of Queen Mullissu-mukannišat-Ninua (the daughter of the king's cupbearer.) The burial was full of luxury goods and provides more evidence of royal affluence. 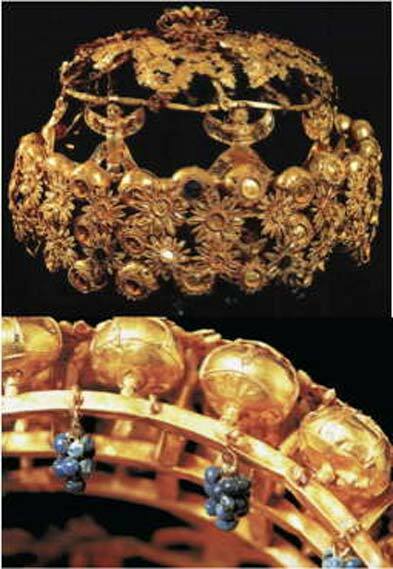 A richly made crown from Tomb III in the Northwest Palace. ( CC BY SA 3.0 ) It’s hung with bunches of grapes made from lapis lazuli . Although it looks very delicate, it weighs over 1kg (2.2lbs)! This crown probably didn’t belong to Queen Mullissu-mukannišat-Ninua – it was found with another woman’s remains. Wall panel relief from the throne room of the palace. (British Museum/ CC BY NC SA 4.0 ) The image shows tribute bearers - one has a North West Syrian type turban and raises clenched hands in submission; the second may be Phoenician and has a pair of monkeys. There is cuneiform script in the middle of the relief. Researchers went back to the city in 2016 and have begun to examine what is left. Although many of the artifacts like the impressive lamassu, will never be recovered, specialists around the world believe that there are still priceless pieces hidden within the ruins. Assurnasirpal II was a powerful ruler whose reign was well-documented. There are hundreds of texts related to different parts of his life and kingdom. This allows researchers to conclude that his reign was one of the most significant in the history of these lands. He ruled Assyria between 883 and 859 BC. 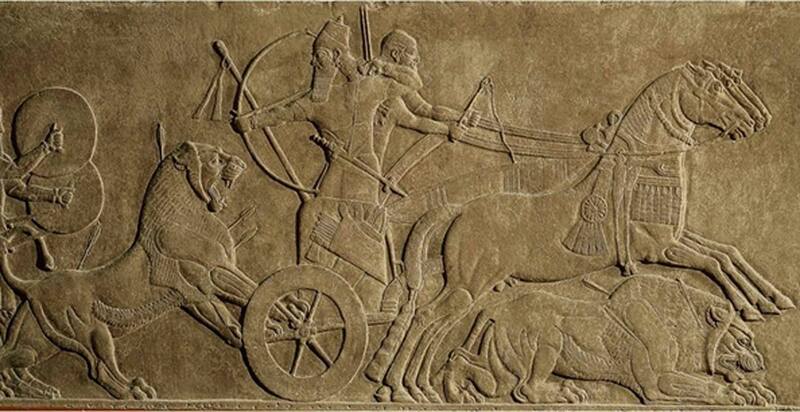 His reign was full of battles and is remembered as a time of immense Assyrian expansion. Assurnasirpal II conquered Asia Minor and many other lands. His kingdom stretched from the land of the Hittites in the North to the Euphrates in the South. Despite heavy damages and dangers associated with excavations, the palace continues to be an object of research. It is likely that there are still some uncovered secrets left by Assurnasirpal II and his people just waiting to see the light of day once again. Cool. I like ancient art, and the ancient desert cities of stone. Would be quite a sight to see, whatwith the lack of ugly advertisements, and ugly signs, and ugly whatnot.